In recent months, ties between Moscow and Riyadh have grown closer than ever. Events such as the December extension of a jointly-managed oil market deal into 2019, as well as an ecstatic high five between Vladimir Putin and Crown Prince Mohammed Bin Salman (MBS) demonstrate the improvement of relations between the two nations. However, far from a simple allegiance between Saudi Arabia and Russia, warmer relations between the two are both indicative of the state of global leadership and potentially problematic for both countries. The shared objective between the two nations is economic – yet within their complicated and burgeoning partnership lie political and security landmines that could potentially erode cooperation. As Saudi Arabia becomes more isolated as a result of the Khashoggi murder, and Russia continues to weather sanctions in the aftermath of the annexation of Crimea and other transgressions, it only makes sense for the two powerhouses to grow closer. It would be a strategic coup d’état if Putin were able to break up the historical relationship between the Americans and the Saudis, and replace the US as Saudi Arabia’s superpower patron. One word: Oil. Combined, Russia and Saudi Arabia control 20% of the global market, which allows cooperation between the two to strongly influence the market. In addition, the Kingdom already holds significant sway over the Organization of Petroleum Exporting Countries’ (OPEC) production, simply because it produces so much. To exacerbate the stranglehold these two have on the oil market, they are both part of the informally dubbed OPEC+, which includes a further ten non-OPEC members. This super-cartel controls 55% of global oil supplies, while retaining 90% of all proven reserves. When OPEC+ wants the oil market to shift a certain way, the market has no choice but to oblige. Beyond cartels, Moscow and Riyadh have retained an independent economic alliance for two years, ever since the oil market collapsed in 2015. To deal with falling oil prices, the two states decided to take matters into their own hands and regulate the market together. This takes the form of production caps and self-restriction – the less barrels are produced, the higher the global price. Russia and Saudi Arabia are in a position to set the price because the other members of OPEC+ have no spare production capacity. This means that the other members will produce their marginal amounts of oil at the same clip, regardless of the output of the two cartel leaders. The oil alliance is as strong as ever, as evidenced by the aforementioned deal to continue this partnership into 2019. The common interest in oil profits increases the interdependency between the two regimes. Oil is a commodity which has its price dictated by the market, so any state that “goes rogue” by over-producing drains profits away from the rest of the cartel and will usually cause the price of oil to drop dramatically due to the surplus of supply. Russia and Saudi Arabia have displayed trust in one another in this regard, and if the rest of OPEC+ do not deviate from their production – unlikely because they are already producing at max capacity – then their agreement appears secure. In the short-term, the oil market management deal between Russia and Saudi Arabia has been fruitful and undoubtedly advantageous for both parties. However, in the long term, this may not continue to be the case. High oil prices encourage the oil production industry to develop in competing countries, such as the United States, where oil output has already increased by 2 million barrels per day (bpd) in the last year. This results in the loss of market share for the OPEC+ leaders. For Russia, this is problematic, as it only needs a price of $40 per barrel in order to balance its federal budget – there is no incentive for Russia to sacrifice market share for steeper oil prices. Saudi Arabia, on the other hand, balances its budget at $70 per barrel. In practice, this means that Saudi Arabia is perfectly fine with forfeiting some of its market share in order to squeeze that much more value out of each barrel of oil. At the moment, Putin values his powerful geopolitical position in the Middle East over the potential extra dollars per barrel. 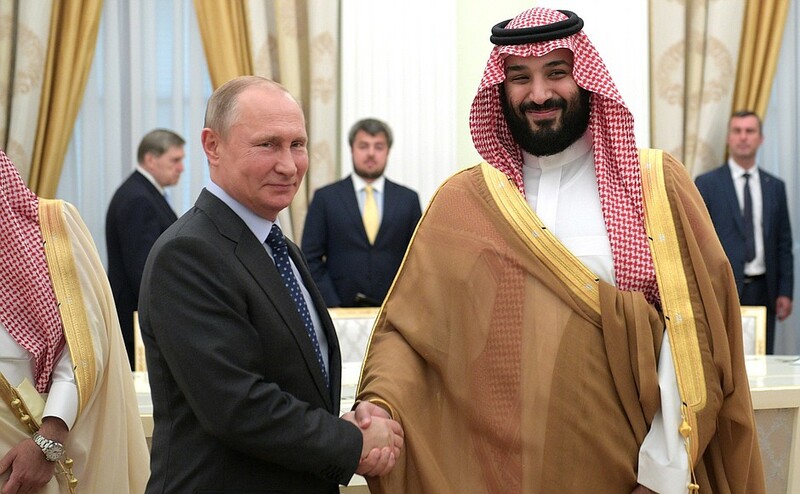 By agreeing to a compromise on oil prices and market share, Putin places Russia in an advantageous arrangement where it is able to fix the oil market whilst maintaining a close relationship with the Saudi Kingdom. Putin is making a choice: he is strategically maintaining Russia’s Middle Eastern relations over pure economic interests. This decision is viable only so long as there is no conflict in the Middle East that could disrupt the status quo and pit Russia’s allies against one another. One such conflict is the existing animosity between Riyadh and Tehran. To date, Saudi Arabia and Iran have only come into conflict through proxy wars. Should their animosity devolve into open and direct conflict, Putin would likely be forced to choose a side. In such an event, the United States would certainly ally itself with Saudi Arabia against Iran. If Russia sided with the Iranians in this event, it would surely sour relations between Russia and Saudi Arabia, not to mention the Kingdom’s other Arab allies. If Russia remained neutral, Iran would regard Russia an untrustworthy ally, as well as sending a signal to all other current and prospective allies of Moscow that Putin is unwilling to come to an ally’s aid. For Moscow, conflict is a trap to be avoided, and its Middle Eastern alliances remain the strongest in relative peace. Finally, the issue of the historical friendship between the United States and Saudi Arabia is problematic for Moscow. Russia currently faces accusations by the United States of election interference, in the latest chapter in the saga of American-Russian enmity. On the other hand, the US and Saudi Arabia are long-standing allies. This challenges the Saudi-Russo agreement. Inevitably, Russia will do something that the United States does not agree with, or vice versa – putting Saudi Arabia in a position to choose between its allies. The alliance between Saudi Arabia and Russia is propped up by Putin’s desire to maintain close relations with the Middle East and his greater goal of edging the United States out if its tight partnership with the Kingdom. There are some significant long term-obstacles to the partnership, but at the moment, it appears to be as solid as ever. Russia is currently accomplishing a feat of strategic foreign policy in the Middle East, maintaining close relationships with the majority of actors despite the hostility between many of them. How the Kremlin manages to maintain strong relations with these fierce opponents, the Kingdom and Iran, is nothing short of fascinating. Moscow sells arms to both Tehran and Riyadh, and Russia’s oil management is beneficial to both nations, extending “most favoured nation” treatment to both states. While juggling relations with the two adversaries may seem a precarious task, it has so far been nothing but advantageous for Moscow. The rivalry between Iran and Saudi Arabia has caused both of the antagonists to seek closer ties with Russia, a consequence that Putin welcomes with open arms. Whether Putin can maintain his country’s complicated system of alliances and make Russia the most influential country operating in the Middle East remains to be seen, but he is certainly is on the path to doing so. Featured image by www.kremlin.ru, via Wikimedia Commons.